The Phone Does Not Ring! As phone junkie, one of the hardest things about living in a new country was getting use to the idea that the phone never rings. It is a fact. I mean, my family and close friends live in other time zones, so they are all sleeping while I am having lunch. And, by the time they leave their office, I am in my Pjs ready to sleep. As time goes by, it does get easier. And once in while, I get a surprising call from a new friend, or my parents back home. This makes my day. Other times, false alarms like wrong numbers or telemarketing, just make me laugh, and remind me to put the phone in silence. 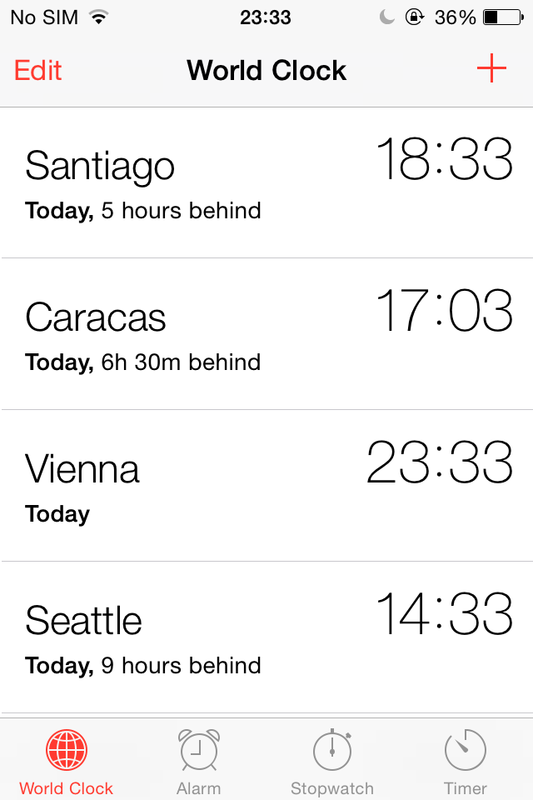 My iphone clock settings. Keeping up with the family.